In America, we tend to value workaholism. But is it really best for you and your business? Research indicates that overwork harms your overall productivity and can even cause problems for your business. Chances are, instead of working more, you probably need to take a break from work. You’re the leader in your business. Overwork harms your business by creating a potential leadership deficit. According to an article in the Harvard Business Review, working too hard can lead to a declining ability to read non-verbal cues and we are more likely to be offended and lash out. These things make it harder to be a good leader. You can easily take offense where none is intended, and it’s also a very real possibility that you could misread a valuable team member and make a huge leadership mistake. Take the time to disconnect from work and recover so you remain a good leader. For most people, lack of sleep can impair decision-making ability and cause other problems with performance. It’s true that there are some people that can function on less sleep. You might even think you’re one of those people. But the reality is that you probably aren’t. Only 1%-3% of the population can function that way. So, instead of sacrificing sleep, get your full amount. You’ll make better decisions, show better stamina when it comes to work, and get more accomplished overall. Overwork harms your business especially with burnout becomes an issue. If you work hard to the point where you start to feel the onset of burnout, it can be a huge problem. You don’t want to get in that place. You lose your passion for your project, and your business can suffer. Instead of overworking yourself, take time for a break. You’ll be a better entrepreneur and business leader overall, and you can keep from letting burnout get the best of you. Work more and you get more from yourself and your workers, right? Actually … no. There is a large body of evidence indicating that working longer hours doesn’t necessarily mean better productivity. In fact, overwork harms your business by reducing productivity. As the workday progresses, employees (and probably you) become less energetic and less efficient. You’re more prone to mistakes and distractions. That weighs on your overall productivity. Studies indicating that fewer hours can lead to a higher quality of work and better productivity have been in place for nearly a century, and they all find that less work is actually more. Let’s not forget about the way poor health outcomes can impact your business. First of all, there are the productivity issues. Sick days and higher insurance costs can impact the bottom line. Plus, unhealthy workers are more likely to be less productive and lead to more turnover. Reducing turnover and maintaining high-quality workers are important goals for any business. Don’t keep working, even when you know you need rest. 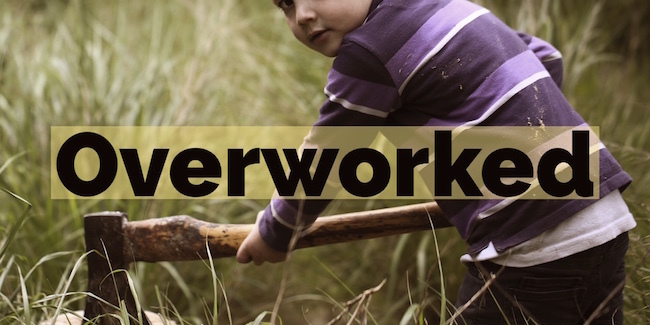 Overwork harms your health and your business.